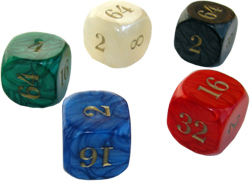 Backgammon Doubling Cubes, Marbleized – Our Marbleized Backgammon Doubling Cubes measure 13/16" and they are available in 5 colors: black, blue, green, red, and white. Shop online 24/7 through our secure shopping cart. Sale Price: $2.45. Was $4.95. Save 50%! You might also be interested in our Leather Backgammon Sets, Leatherette Backgammon Sets and Velour Backgammon Sets.